For Allan Dyson this is the spiritual essence that defines each bottle of wine produced on his 15 acre vineyard, which is tucked in by the ocean just west of the McLaren Vale wine region on the Fleurieu Peninsula. Here since 1977, Allan has worked with Nature to create a perfect environment for his hand-made wines. The vines are dry grown and emerge from a carpet of deep clean straw mulch which conserves moisture, cools the soil and provides a rich haven for the colonies of earthworms that have been introduced to enrich the growing environment. It’s as old-fashioned as Nature itself. The hand-picked fruit is almost bursting with flavor and is processed using traditional methods of basket-pressing and open fermentors. The Cabernets are hand plunged, while the Chardonnay and Viognier are pressed ever so gently before being cold fermented in a temperature controlled Barrel Room. Finally, wines that display classic varietal flavors rich in colour and balanced by firm, even tannins are aged in classic fine-grained French oak bariques. These wines are as bold or as delicate as the palate desires. It’s the way all wine used to be made – and we like it that way! The above just says it all. Allan is such an interesting man to talk to and one gets a sense of passion to assist nature to produce one of it’s drinks – wine. 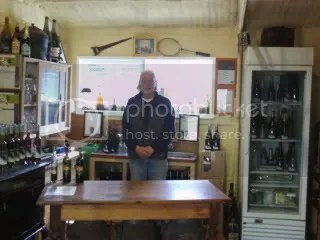 He firmly believes that wine is made from grapes and that is what the winemaker should strive for – to make wine that is true to the nature of the grape. 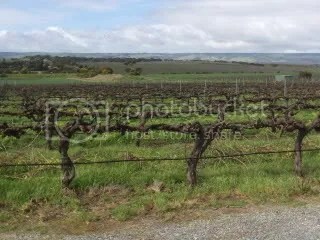 He aligns himself with nature by nurturing his vineyards, looks after the soils, uses dry grown ideals. Also all is done at the winery – hand picking (into buckets that are cooled before processing), basket pressing, cold ferments, oak maturation, bottling and bottle aging. Allan also believes the industry has lost it’s way somewhat and that we need to go away from these big fruit bombs with massive oak and produce more restrained wines that can be consumed while eating food and not making one want to curl up and go to sleep. These are in 375 mL bottles with the oils for $15 and sauces for $8. In a few months there will be a Chardonnay/Viognier blend that Allan is quite excited about and a new Cabernet will be seen soon. Also, interestingly, there looks like some Chardonnay vines are soon to be grafted to Tempranillo. Something else to watch with interest in the coming years. The grapes for this wine do not come from the Dyson vineyard. It is made as a semi dry, fruity and easy drinking style that just walks out the cellar door during the warm months. As for the Sparkling White above this wine is made from non-Dyson vineyard grapes. It is not too sweet and is just made for easy summer drinking. Not what I would call a food wine, but something to enjoy with friends, and at this price why not. The aromas were restrained but the flavors were somewhat of a surprise. There is not the normal apricot one gets from a lot of wines from this grape. The wine shows Allan’s vision of showing the grape characters. To go with this is some yeastyness and a rich mouthfeel and a good acid balance. A wine that could go a few more years yet. A 2006 Chardonnay being the new current release wine – how interesting. The wine had the same restrained aromas as the Viognier but the flavors are all melons and a little stone fruit. The French oak adds a lovely complexity and structure to the wine that indicates the wine still has a few years left. Again, an aged wine as the current release. This just shows Allan’s commitment to not releasing his wine until he thinks the wine is starting to show it’s best. You only get this at the small wineries. The aromas were restrained berries, cedar and violets. Flavors were just like eating Cabernet berries without the sugar and some soft oak. The wine is just a soft infusion of berry and oak and it drinks so well. I can see this wine appealing to many a wine drinker and would go with many a meal – from the Chicken Minions (I had with it tonight) through to pizza or pasta. This is 16 year old Liqueur Sauvignon Blanc that has been sitting in old Sherry barrels in the cellar door. Allan just siphons some off for bottling as required. The wine is not fined or filtered and is such an interesting drink. The flavors are like burnt caramel and is not as sweet as I had expected. The layers of flavors are there for the drinker to see – worth the effort to check out this point of difference. Another way to sell Chardonnay – 1990 Chardonnay at that. The wine coats the glass as it also coats the tongue with strong almost burnt toffee flavors that is not as viscous as I was expecting. Another different (in a good way) wine that should be checked out. I look forward to sharing my bottle with friends. 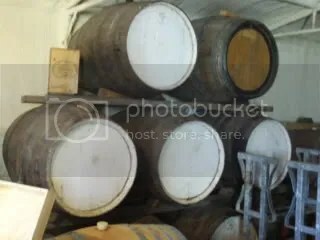 This entry was posted in Mclaren Vale, wine and tagged Cabernet Sauvignon, cellar door, Chardonnay, Mclaren Vale, McLaren Vale Wine, Small Producer, Viognier, wine McLaren Vale. Bookmark the permalink.